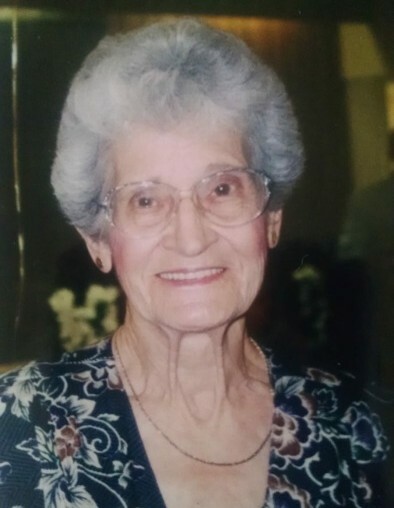 Jodie Christine Bryson Rich, age 96, of Woodbury passed away Monday, August 20, 2018 at Woodbury Health & Rehab. She was born on January 25, 1922 to the late Joe Bryson & Tina Barrett Bryson in Cannon County. Survivors include her children, Robert W. (Wanda) Rich of McMinnville, Jerry (Nell) Rich of Knoxville, & Larry (Joan) Rich of Woodbury; Sister, Irene Rich of Murfreesboro; Grandchildren, Charlie Rich, Michelle Rich, Tracey Reed, Justin Rich, Jennifer Conner, Bryan Rich, Kevin Rich, TJ Rich, & Kortny Blaylock; and Great Grandchildren, Ashley Ross, Jessica Jenkins, Kayla Kincer, Kyle Van Patten, Christian Rich, Nicholas Reed, Blake Reed, Braeden Rich, Ethan Conner, Brooklyn Blaylock, Brody Blaylock, Landin Rich, Dillin Rich, & Masin Rich; and Great Great Grandchildren, Kallie & Braden Ross; and Daughter-in-law, Mary Rich of Marietta, GA. In addition to her parents, Ms. Rich was preceded in death by her husband, Floyd Leburn Rich; Sons, Thomas & Donnie Rich; Sister, Evelyn Hayes; Daughter-in-law, Ella Rich; and Granddaughter, Tammy Rich; Half-Brothers, Johnny Bryson, Bobbie Lee Bryson, & Elburn Bryson; Half-Sisters, Bonnie Bryson, Bird King, & Eva Adams. Ms. Rich was a member of the First Baptist Church and was retired from the cutting department at White Stag. She also volunteered her time at the hospital. Funeral Services will be 2 PM Friday, August 24, 2018 in the Chapel of Woodbury Funeral Home with Bros. Bobby Nichols & Thurman Seber officiating. Interment will follow at Riverside Gardens Cemetery. Visitation with the family will be from 2 to 8 PM Thursday, August 23, 2018.